Since I decided to give this blog a makeover, I figured I should probably share the recipe for this wonderful pizza. This pizza has so much flavor! Don't worry about having all the ingredients for the peanut dipping sauce because they're just too expensive. You could easily buy some jarred peanut sauce and mix it with the rest of the ingredients. Improvise! It's what I do best. Combine the chicken with the soy sauce, honey, and cornstarch and let marinate at room temperature for 10 minutes. Heat a nonstick frying pan over high heat. When hot, add the chicken pieces and saute for 2 to 3 minutes, until cooked through. Prepare pizza dough and place on pan. Brush the olive oil all over the edges of the dough. 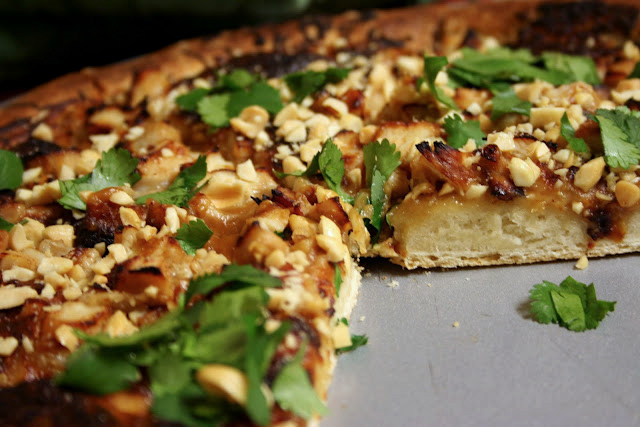 Spread the peanut dipping sauce on the dough. Top with the mozzarella and cooked chicken. Bake for 15 to 20 minutes, until the cheese is melted and the edges are golden brown. 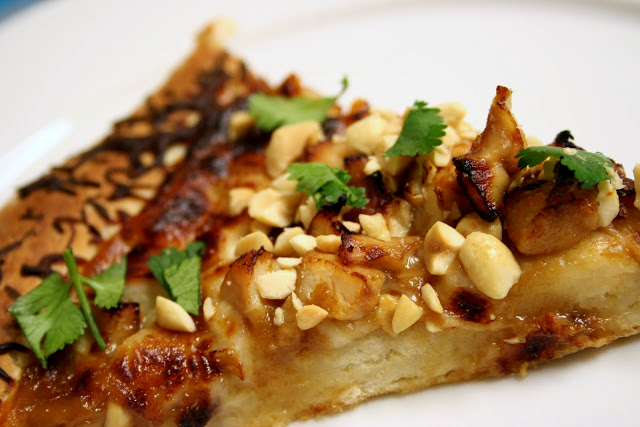 Remove from the oven, top with cilantro and roasted peanuts. Heat the oil in small saucepan over medium-low heat. When the oil is just starting to get hot, add the garlic and ginger and fry for 30 seconds until fragrant. Add the sweet chili sauce, hoisin sauce, water, and peanut butter and stir until smooth. Simmer until thickened. Let cool.